Author Doris-Maria Heilmann has extensive experience as a magazine and book publisher (in non-fiction and aviation – reflecting her experience as a pilot trainer), in e-publishing, book marketing, web and graphic design, professional photography, writing for the web, editing, investigative journalism, social media and e-marketing. She has become a much sought after teacher and lecturer in all aspects of publish and marketing and hence this excellent survey of the creation and use of videos. The areas covered in this accessible, easy to follow guide include video trends, video composition, checklists for video shoots, production tutorials, all about editing, SEO (Search Engine Organization) and keyword planning, business and marketing videos, creating professional learning videos, video launch, uploading – and making more money, how to market your video, video equipment, video creation software, production costs, free and royalty free music, and free and royalty free images. And with each of these categories the author provides excellent Tips to enhance learning and absorption of the offered information – a total of 111 very valuable and wise tips! 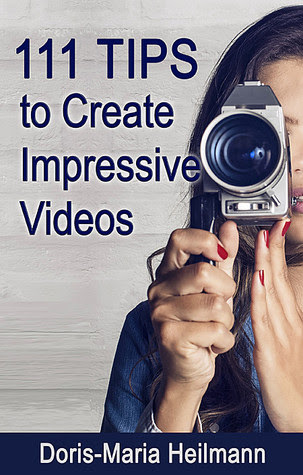 Definitely a reference book for learning all about the use of creating videos – whether for personal use, educational use, or for enhancing marketing for businesses.